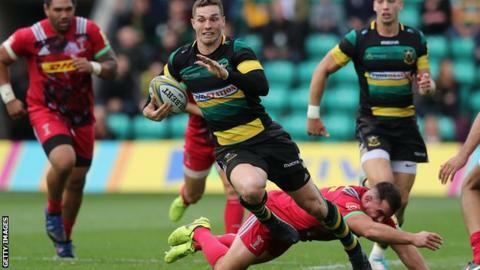 Northampton Saints went top of the Premiership as they beat Harlequins for a fourth league win in a row. George North, Tom Collins and Mike Haywood tries helped put Northampton 19-15 up at the break, with Aaron Morris and Jamie Roberts responding. Ahsee Tuala's try secured a bonus point for Saints before Dave Ward grabbed Quins' third try. Saints' third bonus-point win of the season moves them ahead of Newcastle on points difference at the summit. It is a remarkable turnaround by Northampton, who began the season with a 55-24 thumping by Saracens at Twickenham. The defeat may yet prove more costly for Quins as England prop Kyle Sinckler was accused of gouging after appearing to make contact with Michael Paterson's head during a maul in the 49th minute. The incident was scrutinised by the television match official, and while replays were inconclusive, a penalty was awarded on the field as the front rower did remove Paterson's scrum cap in the brief clash. It was a spirited Quins showing in the absence of a number of injured key players, including England trio Mike Brown, Chris Robshaw and Joe Marler, and Australia lock and club captain James Horwill, but they have now lost three of their five league games. For Northampton, highlights of their 10th win in the past 11 games at Franklin's Gardens in all competitions were the improving form of Wales wing North and fine work by scrum-half Nic Groom. "I don't know anything more than what everybody else saw on the big screen. "Cleary he [Michael Paterson] brought something to the referee's attention but we will have to wait and see what comes out of that. "This was not the prettiest, but it was a good win for us to bounce back after that first game and we have now got a bit of momentum. "I don't think that was Championship-winning rugby out there, but it is winning rugby and that's what is important at this time of the season." Northampton: Tuala; North, Horne, Burrell, Collins; Mallinder, Groom; Waller, Haywood, Brookes, Paterson, Ribbans, Lawes (capt), Gibson, Harrison. Replacements: Marshall, Van Wyk, Ford-Robinson, Ratuniyarawa, Dickinson, Reinach, Myler, Foden. Harlequins: Morris; Yarde, Marchant, Roberts, Visser; Smith, Care; Lambert, Ward (capt), Sinckler, Merrick, Matthews, Glynn, Clifford, Luamanu. Replacements: Elia, Holenstein, Swainston, Lamb, White, Lewis, Swiel, Alofa.